We've finally done it! We've found the MOST expensive city in Europe! If you're looking for a major European city that is lovely, but entirely overpriced then Geneva is your place. Geneva street proudly waving the flag. If you invert the colors of the flag.......you get the Red Cross symbol. Coincidence? Nope! The Red Cross/Crescent Movement was started here by a Genevan man. Flower Clock. The Swiss are all about their timepieces. They are home to Rolex, Swatch and other swanky watchmakers. 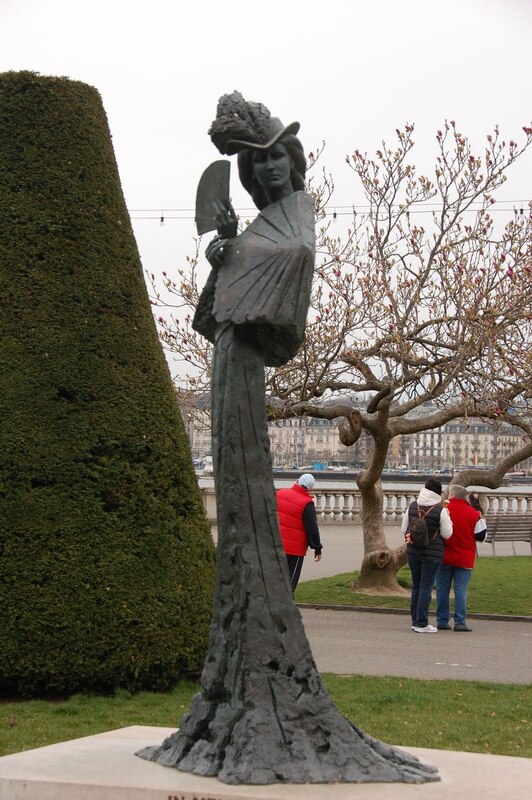 Marisa's favorite statue alongside Lake Geneva. Time for a side note........Pop Quiz.........what language is spoken in Switzerland?.....................scroll down for answer. 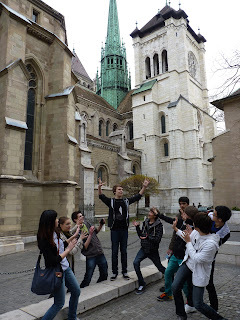 So we trekked down to Geneva for a field trip with the physics students at our school (see previous post on CERN) primarily to see the particle accelerator, but since we couldn't spend all of our time at CERN we ended up checking out the city as well. Situated on the French border and on its self-entitled lake, Geneva is a fancy town famous for watches, a very large and impressive water fountain in the lake, the Red Cross and Red Crescent Movement, and the home of John Calvin's "Calvinist" movement during the Reformation. 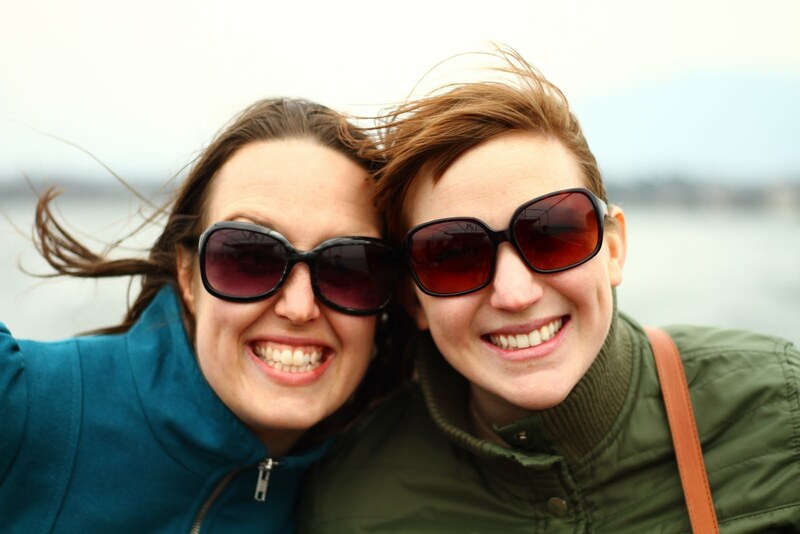 Marisa and our colleague, Kate, pretending it wasn't that cold. 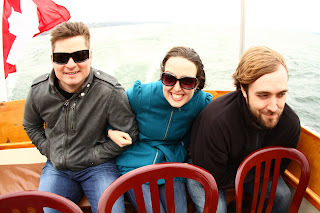 Our beautiful boat cruise on Lake Geneva. Yes, it was this cold. Quiz Answer.........if you said "French", "German", or "Italian" then you are correct!! What was surprising is that the languages seem to be somewhat exclusive to certain regions and cities. In Geneva, for example, French was practically the only language spoken. Had we gone to Zurich, near the German border, we would've only heard Swiss German. Italian is spoken in a smaller region along the southern border with Italy. Marisa and I planned a photo scavenger hunt for our students where they ran around the town to snap creative shots of their group in front of landmarks and other sights of interest in town. It was a nice way to see the sights and enjoy the mild weather. The only downside to Geneva, and most of Switzerland as I've heard, is that everything is wicked expensive. You would think that everything was laced with gold. Even the "Euro Menu" at McDonald's only featured items that were priced at 2.50 Swiss Francs (currently about 1.20 Swiss Francs = 1 Euro). Otherwise, it was a pleasant place to visit............but you won't need more than a weekend here. Winning shot of Marisa's group in front of the Jet d' Eau in Lake Geneva. Our colleague's group's shot in front of the Reformation Wall. Marisa's group again, performing an opera in front of the Opera House in one of the main squares.